The deployment planner report provides the cost estimation summary in Recommendations sheets and detailed cost analysis in Cost Estimation sheet. It has the detailed cost analysis per VM. The current version of Deployment planner tool does not provide cost estimation for VMs replicating to Managed Disks. DR Drill cost estimates are the same for storage accounts and managed disks, when 'Use Managed Disks' parameter is set to "Yes" on "Compute and Network" blade. Set the "Cost duration" parameter in Settings table to "Year"
The replication cost will be similar to the cost populated in column 'R' i.e. DR-Drill storage cost per year in DR-Drill cost per year sub-section. The summary helps you to understand the cost that you need to pay for storage, compute, network, and license when you protect all your compatible VMs to Azure using Azure Site Recovery. The cost is calculated on for compatible VMs and not on all the profiled VMs. You can view the cost either monthly or yearly. Learn more about supported target regions and supported currencies. Cost by components The total DR cost is divided into four components: Compute, Storage, Network, and Azure Site Recovery license cost. The cost is calculated based on the consumption that will be incurred during replication and at DR drill time for compute, storage (premium and standard), ExpressRoute/VPN that is configured between the on-premises site and Azure, and Azure Site Recovery license. Cost by states The total disaster recovery (DR) cost is categories based on two different states - Replication and DR drill. Replication cost: The cost that will be incurred during replication. It covers the cost of storage, network, and Azure Site Recovery license. DR-Drill cost: The cost that will be incurred during test failovers. Azure Site Recovery spins up VMs during test failover. The DR drill cost covers the running VMs’ compute and storage cost. Azure storage cost per Month/Year It shows the total storage cost that will be incurred for premium and standard storage for replication and DR drill. Azure prices for compute, storage, network, etc. varies across Azure regions. You can generate a cost estimation report with the latest Azure prices based on your subscription, the offer that is associated with your subscription and for the specified target Azure region in the specified currency. By default, the tool uses West US 2 Azure region and US dollar (USD) currency. If you have used any other region and currency, the next time when you generate a report without subscription ID, offer ID, target region, and currency, it will use prices of the last used target region and last used currency for cost estimation. This section shows the subscription ID and offer ID that you have used for report generation. If not used, it is blank. In the whole report, the cells marked in gray are read only. Cells in white can be modified per your requirements. The first section shows the overall DR cost by components and DR cost by states. Compute: Cost of IaaS VMs that run on Azure for DR needs. It includes VMs that are created by Azure Site Recovery during DR-drills (test failovers) and VMs running on Azure like SQL Server with Always On Availability Groups and domain controllers / Domain Name Servers. Storage: Cost of Azure storage consumption for DR needs. It includes storage consumption for replication and during DR drills. Network: ExpressRoute and Site to Site VPN cost for DR needs. ASR license: Azure Site Recovery license cost for all compatible VMs. If you have manually entered a VM in the detailed cost analysis table, Azure Site Recovery license cost is also included for that VM. The total DR cost is categorized based on two different states - replication and DR-Drill. Replication cost: The cost incurs at the time of replication. It covers the cost of storage, network, and Azure Site Recovery license. This table shows premium and standard storage cost incur for replication and DR drills with and without discount. Select the appropriate setting as per your requirements. ExpressRoute: By default, the tool selects the nearest ExpressRoute plan that matches with the required network bandwidth for delta replication. You can change the plan as per your requirements. VPN Gateway: Select the VPN Gateway if you have any in your environment. By default, it is NA. Target Region: Specified Azure region for DR. The price used in the report for compute, storage, network, and license is based on the Azure pricing for that region. If you have any domain controller or DNS VM or SQL Server VM with Always On Availability Groups running on Azure for DR, you can provide the number of VMs and the size to consider their computing cost in the total DR cost. If you are an Azure partner or a customer and are entitled to any discount on overall Azure pricing, you can use this field. The tool applies the discount (in %) on all components. This table shows the number of Windows and non-Windows VMs and DR drill compute cost for them. Using managed disk: It specifies whether managed disk is being used at the time of DR drills. The default is yes. If you have set -UseManagedDisks to No, it uses the unmanaged disk price for cost calculation. Currency: The currency in which the report is generated. Cost duration: You can view all costs either for the month or for the whole year. Click on the 'Insert row' button to insert a new row between the Start and End rows. You can apply the same value to all VMs in the table by clicking the 'Apply to all' button for Number of DR-Drills in a year, Each DR-Drill duration (Days), Data redundancy, and Azure Hybrid Use Benefit. Click 'Re-calculate cost' to update cost. VM Name: The name of the VM. Number of VMs: The number of VMs that match the configuration. You can update the number of the existing VMs if similar configuration VMs are not profiled but will be protected. IaaS size (Recommendation): It is the VM role size of the compatible VM that the tool recommends. IaaS size (Your selection): By default, it is the same as recommended VM role size. You can change the role based on your requirement. Compute cost is based on your selected VM role size. Storage type: The type of the storage that is used by the VM. It is either standard or premium storage. VM total storage size (GB): The total storage of the VM. Number of DR-Drills in a year: The number of times you perform DR-Drills in a year. By default, it is 4 times in a year. You can modify the period for specific VMs or apply the new value to all VMs by entering the new value on the top row and clicking the ‘Apply to all’ button. Based on number of DR-Drills in a year and each DR-Drill duration period, the total DR-Drill cost is calculated. Each DR-Drill duration (Days): The duration of each DR-Drill. By default, it is 7 days every 90 days as per the Disaster Recovery Software Assurance benefit. You can modify the period for specific VMs or you can apply a new value to all VMs by entering new value on the top row and clicking the ‘Apply to all’ button. The total DR-Drill cost is calculated based on number of DR-Drills in a year and each DR-Drill duration period. OS Type: The OS type of the VM. It is either Windows or Linux. If the OS type is Windows, then Azure Hybrid Use Benefit can be applied to that VM. Data redundancy: It can be one of the following - Locally redundant storage (LRS), Geo-redundant storage (GRS) or Read-access geo-redundant storage (RA-GRS). Default is LRS. You can change the type based on your storage account for specific VMs or you can apply the new type to all VMs by changing the type of the top row and clicking ‘Apply to all’ button. The cost of storage for replication is calculated based on the price of data redundancy that you have selected. Azure Hybrid Benefit: You can apply Azure Hybrid Benefit to Windows VMs if applicable. Default is Yes. You can change the setting for specific VMs or update all VMs by clicking the ‘Apply to all’ button. Total Azure consumption: It includes compute, storage, and Azure Site Recovery license cost for your DR. Based on your selection it shows the cost either monthly or yearly. Steady state replication cost: It includes storage cost for replication. Total DR-Drill cost (average): It includes compute and storage cost for DR-Drill. ASR license cost: Azure Site Recovery license cost. 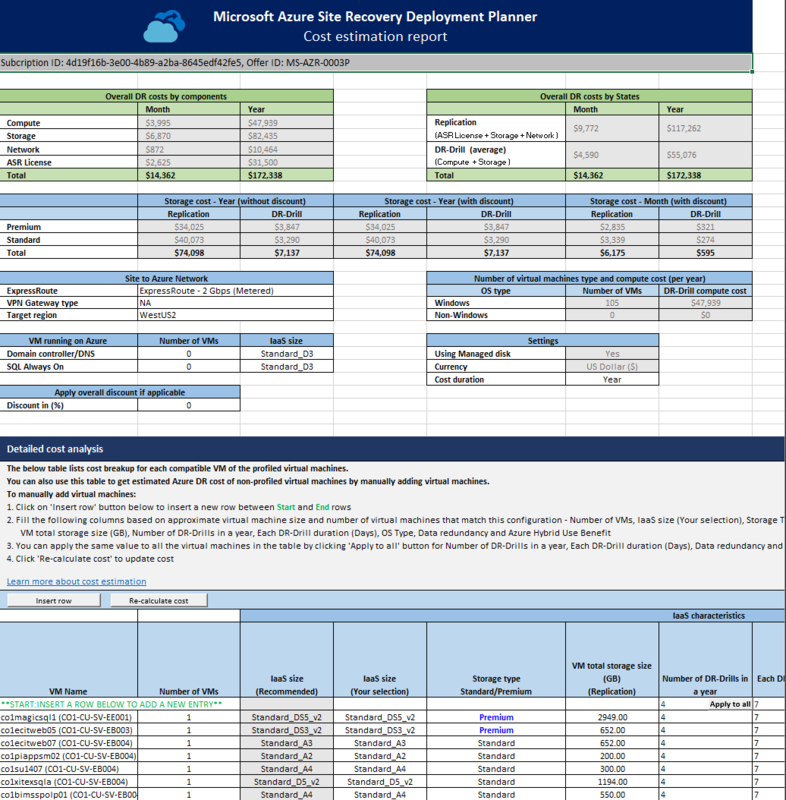 The Azure Site Recovery deployment planner provides cost estimation for the following Azure regions. If your region is not listed below, you can use any of the following regions whose pricing is nearest to your region. The Azure Site Recovery Deployment Planner can generate the cost report with any of the following currencies. Learn more about protecting VMware VMs to Azure using Azure Site Recovery.